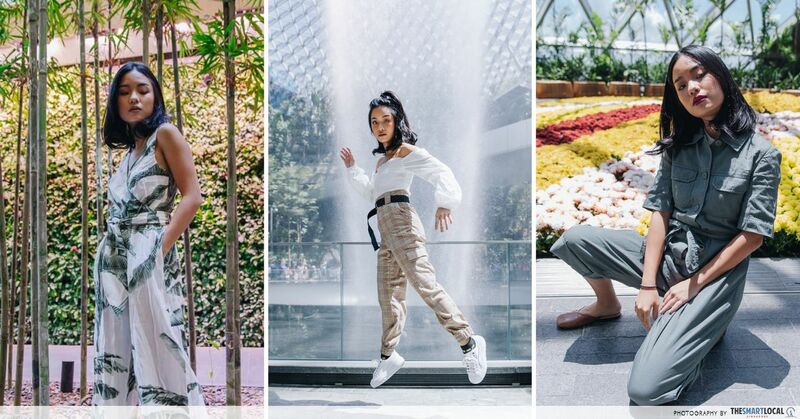 It's quite hard to believe that anyone's love for food trumps that of Singaporeans. After all, as self-proclaimed foodies, our culinary scene is something we're all incredibly proud of - you could even say it makes up a good portion of our national identity! Durian may be an acquired taste - and smell - and there's one way to find out if your friends are fans of the King of Fruits or not! 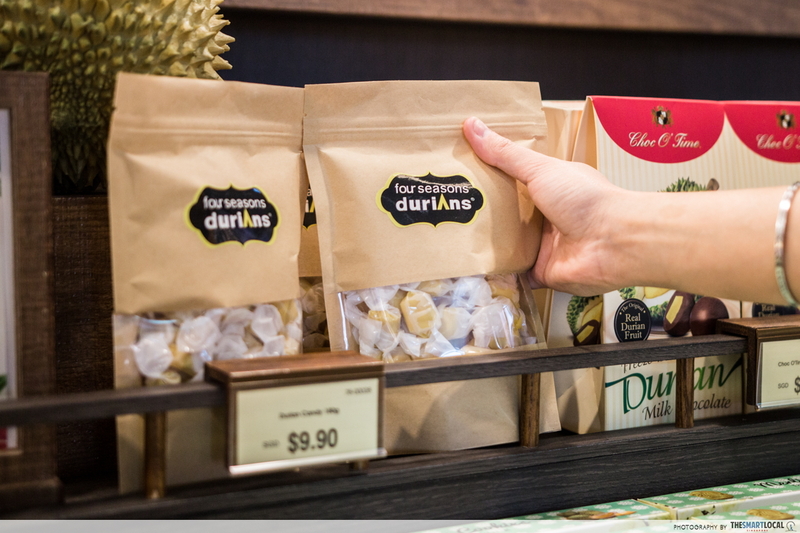 Four Seasons Durian has repackaged this flavour in the form of little Durian Candies ($9.90), which will have no problem going through customs. 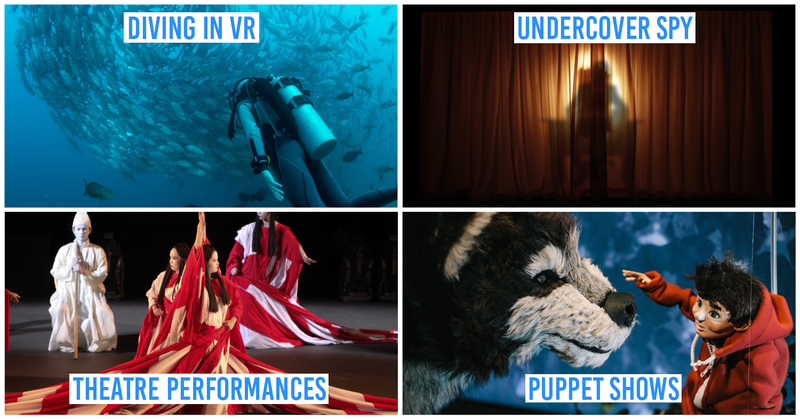 So next time you’re hopping on a plane to visit friends overseas, bag a couple of these. On the plus side, you don't have to get creative trying to pack them prickly fruits into your luggage and risk all your clothes smelling like a durian farm. PB&J sandwiches have nothing on Kaya Toast - a local breakfast essential unique to Singapore that's typically paired with soft-boiled eggs and a hot cuppa kopi (coffee). 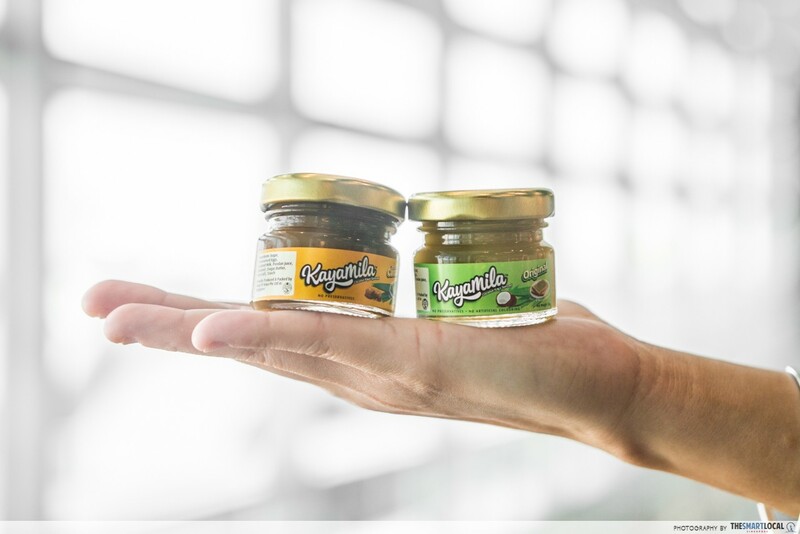 Kayamila is spicing things up with their latest range of new kaya (coconut-egg jam) flavours, including Seasalt Caramel, Vanilla Pandan and Calamansi Citrus. 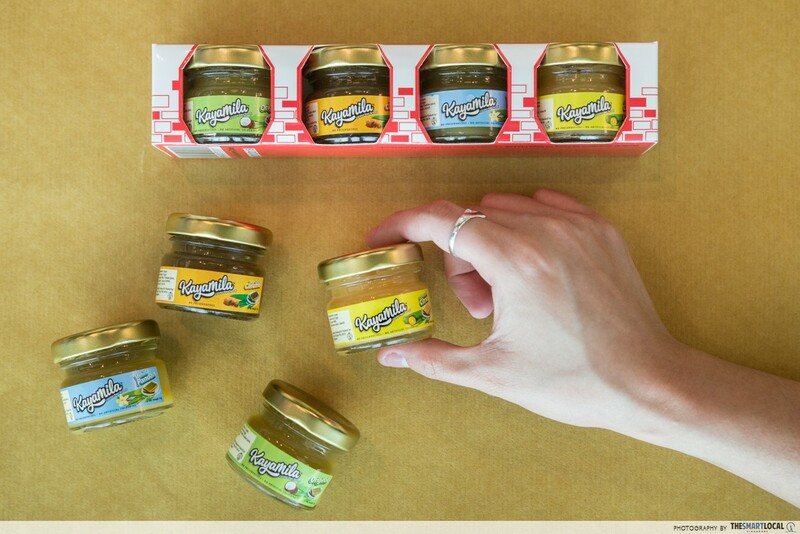 These cute, tiny jars come in a set of 4 ($12), and will make for the perfect little gift for those who want a taste of home during brekkie. 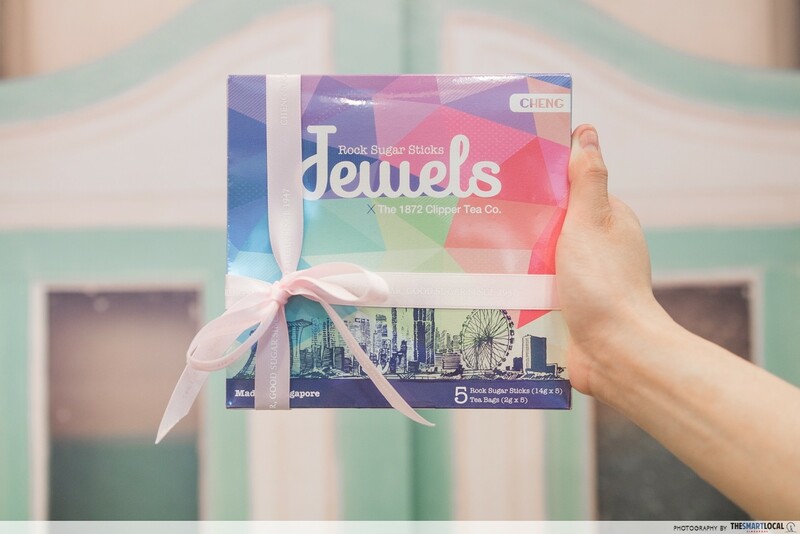 If you're one to take your tea sweet, Jewels Tea Gift Box ($20) are just what you need. 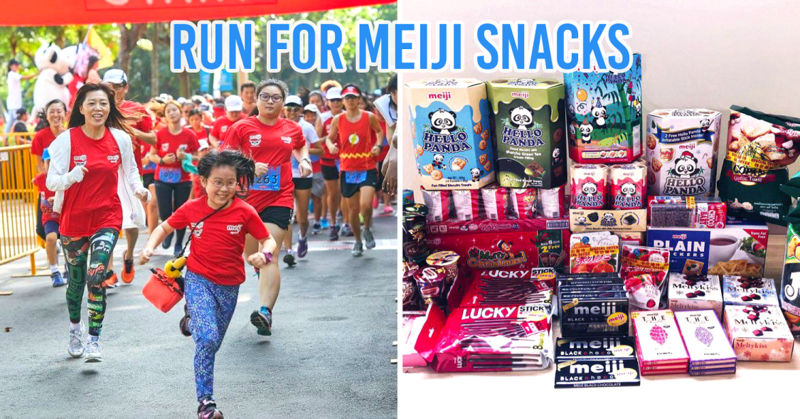 Homegrown brands Chew Yew Heng Candy Factory and The 1872 Clipper Tea have teamed up to come up with a range of 5 rock sugar sticks, all of which come in different colours and flavours such as the SG-inspired tropical Singapore Sling, French Vanilla, Jujube, Lemon Fiesta, and regular plain sugar. The package also comes with a pack of 5 sachets of Clipper Tea's teas for you to mix the sticks into - so move aside, sugar cubes. When it comes to pairing drinks while chowing down hawker centre nosh, local kopi (coffee) or teh (tea) is where it's at. 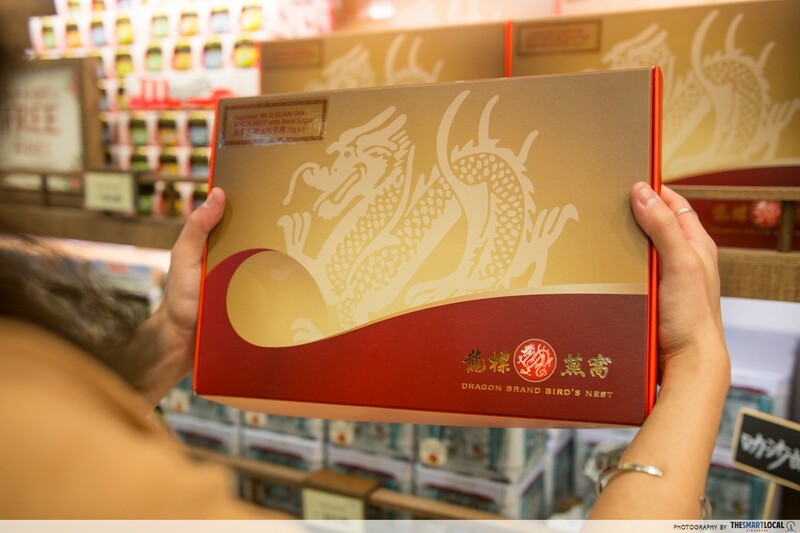 Get your overseas friends a box of Gold Kili‘s Ginger Milk Tea ($8.90) - or more affectionately, ‘teh halia’. Just mix it in a mug of water and voila - a coffeeshop classic right at home. Gold Kili has deployed this tea in sachet form for easy consumption, so it makes for easy carrying and packing. 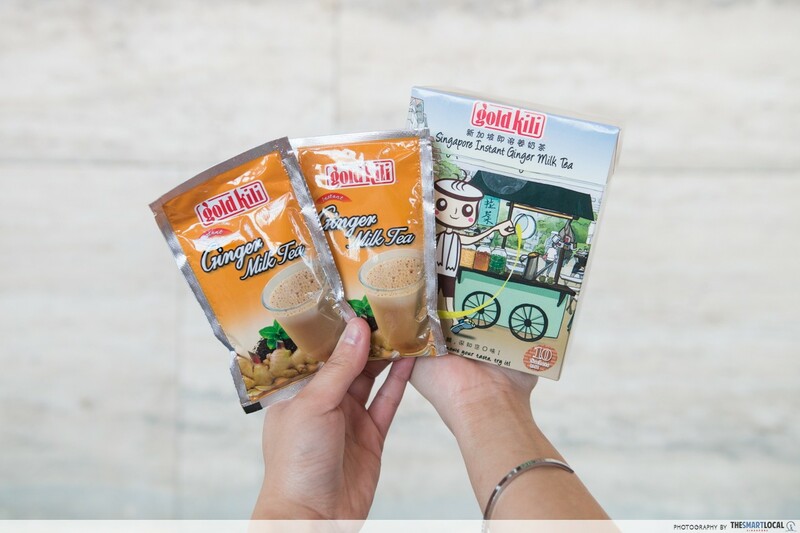 Plus, the box comes in an adorable design complete with a little kopi man and a traditional drink cart. 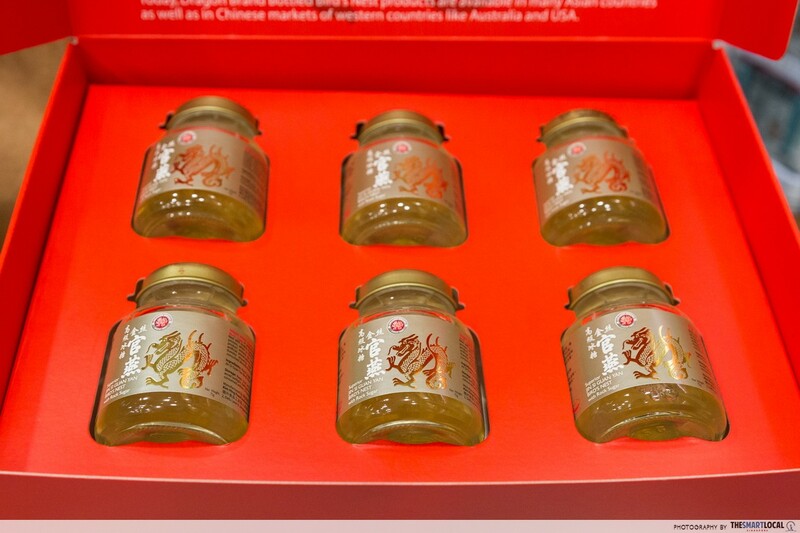 If you’re looking for something meaningful and new to give your pals, consider Kim Hing’s Dragon Brand Superior Jin Si Guan Yan Bird’s Nest with Rock Sugar ($78), which has 6 jars packed elegantly into this box. Bird’s Nest is made with the solidified spit from a swallow, which is collected, harvested, and packed to be sold. I wouldn’t blame you if that description puts you off - but don’t knock it till you try it! The Bird’s Nest are thick and short transparent “tendrils” with a slightly chewy texture. The rock sugar-flavoured soup actually makes it quite tasty overall, because the Bird’s Nest itself doesn’t really have any taste to it. Known for its super high health benefits, Bird’s Nest can be more on the expensive side, which is why most Asians consider this a valuable gift to have. 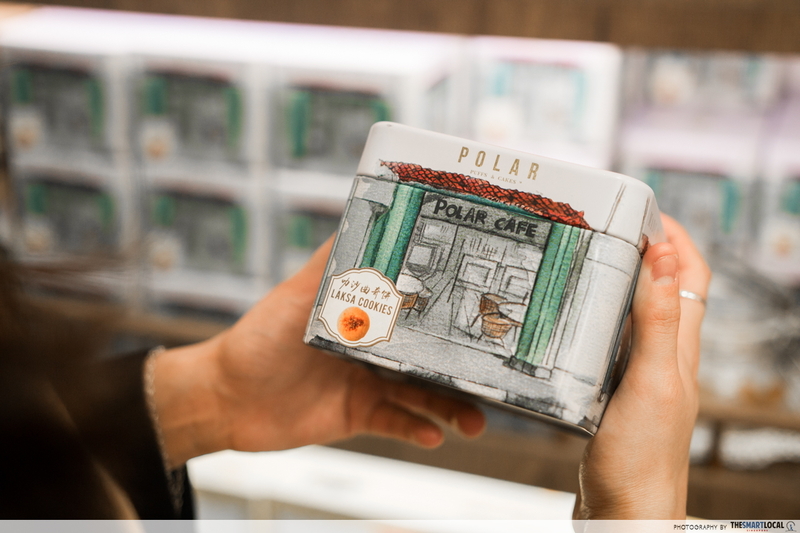 The cookie tin features the Polar Cafe from the 1920s - good luck resisting if you’re a sucker for pretty packaging! 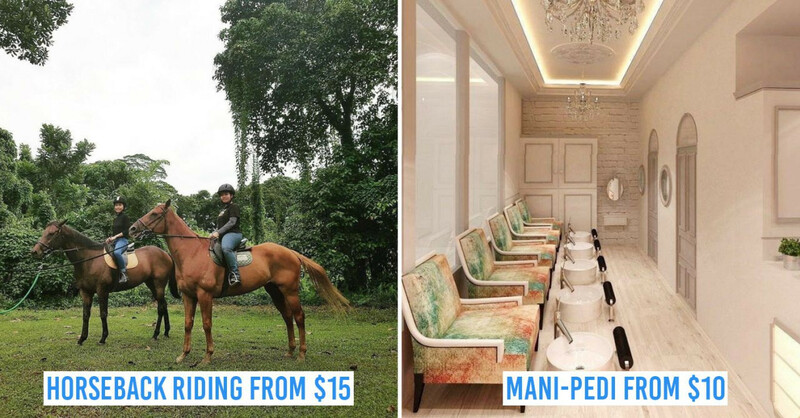 Polar Puffs and Cakes are well-known in SG for their swiss rolls, but this time, they’ve got a quirky take on Singapore’s beloved noodle dish: Laksa Cookies ($13.80). Yep, you read that right - it’s laksa in the form of munchy biscuits. For the uninitiated, laksa consists of rice noodles, seafood and tau kwa - a kind of tofu, which is served in a spicy coconut broth that can get some of us sweating if done right! 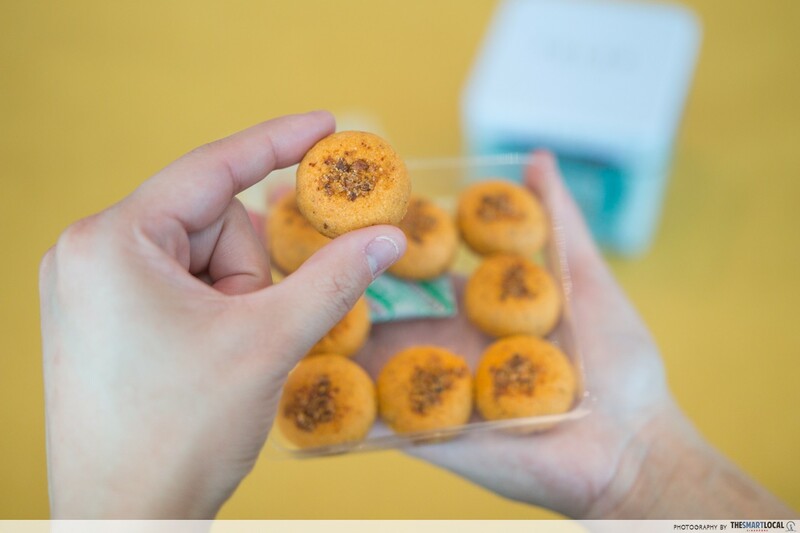 Each cookie comes packed with a spicy blend of sambal (mixed chilli paste) and coconut milk, and the spiciness really does come through along with a hint of coconut. This definitely makes for a unique treat for all laksa lovers out there. Here's the deal: you can't leave Singapore without trying Hainanese Chicken Rice - one of Singapore's most iconic dishes. 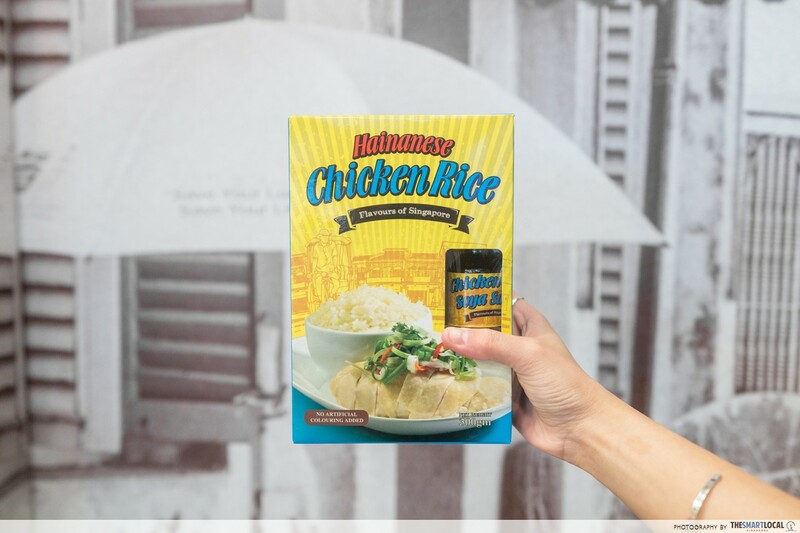 With Amoy Canning's Hainanese Chicken Rice Cooking Kit ($19.90), you can enjoy this hawker fave in the comforts of your own home, no matter where in the world you are. The kit comes with ready-made chicken rice and ginger marinade pastes, plus a bottle of chicken rice soya sauce for a hassle-free meal prep. Bak kwa, a salty-sweet dried meat snack, is always our go-to Chinese New Year treat, and absolutely cannot be missing on the table of sweets. 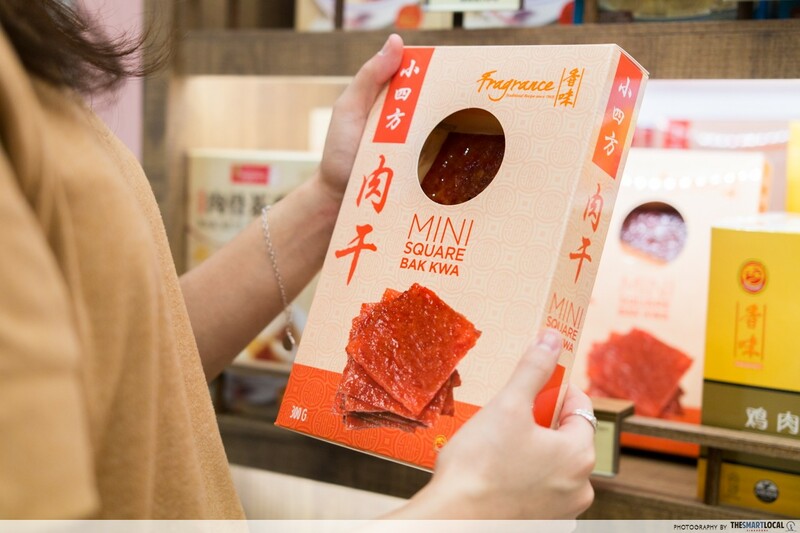 Fragrance now has their Signature Sliced Tender Bak kwa in Mini Squares ($25.90), which makes for the perfect CNY treat for Singaporeans who might be missing out on the festivities while abroad. What’s more, having these down-sized bak kwa packets definitely mean you can have more without feeling too guilty. 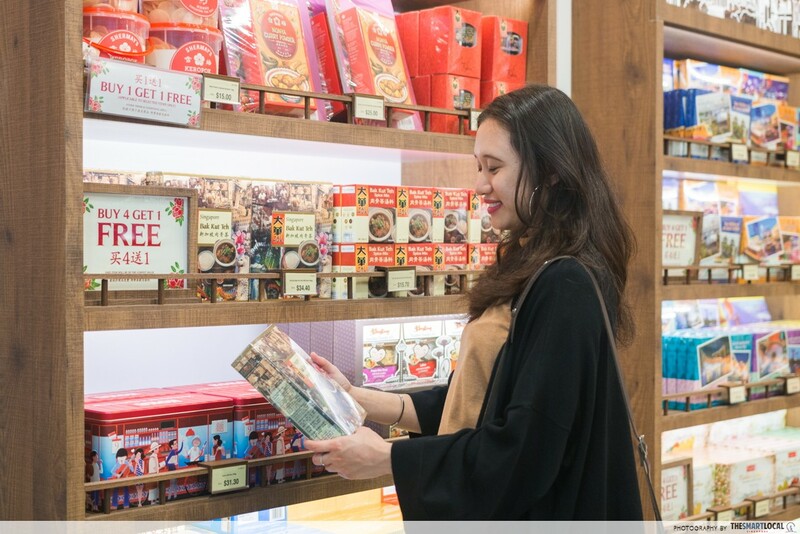 You get a neatly packed set of 2 premium soy sauces, Chinese tea leaves, a spice mix and a special edition bowl! The best bak kut teh - pork ribs in herbal broth - can only typically be found in hawker centres and coffeeshops, so most times we can only ever eat it outside when our cravings hit us hard. Bak Kut Teh can be super easy to cook at home though, provided one has the right ingredients. 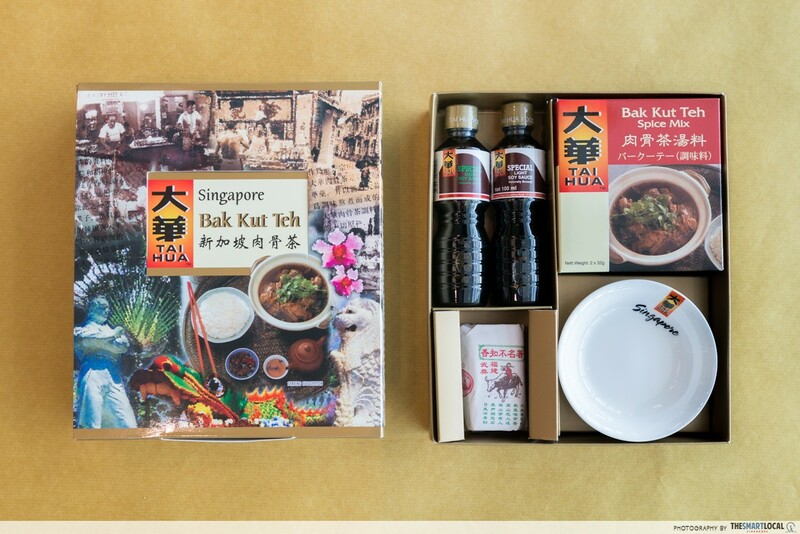 This is where Tai Hua’s Bak Kut Teh Gift Set ($34.40) comes in handy. Gift a box of this to someone who’s an avid fan, or if you’re a visitor, buy a box of this soupy goodness back to your home country. The gift set comes with all the necessary ingredients, so there’s no need to go sourcing out for these ingredients on your own! For those who’ve browsed the cooking section in a bookstore before, you might have come across Shermay Lee’s cookbooks, which are full of Peranakan recipes. The Peranakan cuisine is a unique blend of Malay and Chinese cooking methods and spices, and the result are dishes that burst with flavour. 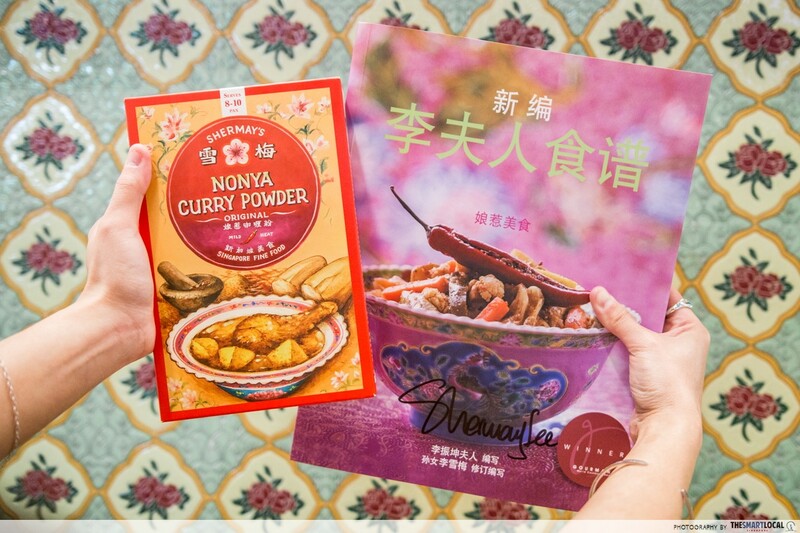 Shermay Lee has released her special Nonya curry powder ($25) recipe, together with an autographed copy of her cookbook as a gift set. We hear this recipe has been passed down for many generations, so if you’re looking for a hearty dish to cook on a rainy day at home, this is it. Note: The cookbook recipes are in Chinese. Just like how there are different types of pasta noodles in existence, so too are there tons of noodles when it comes to hawker food in Singapore. 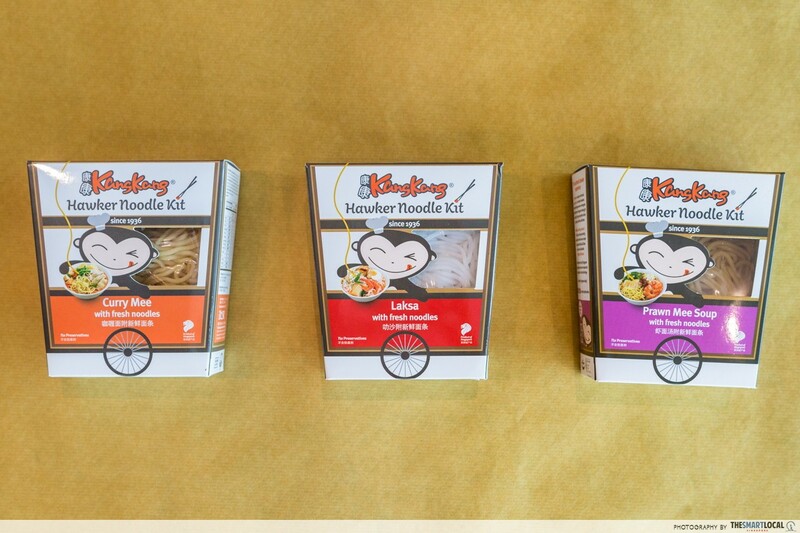 For ultimate noodles fiends, Tan Seng Kee’s Kang Kang Singapore Hawker Gift Set ($25.90) will be right up their alley. 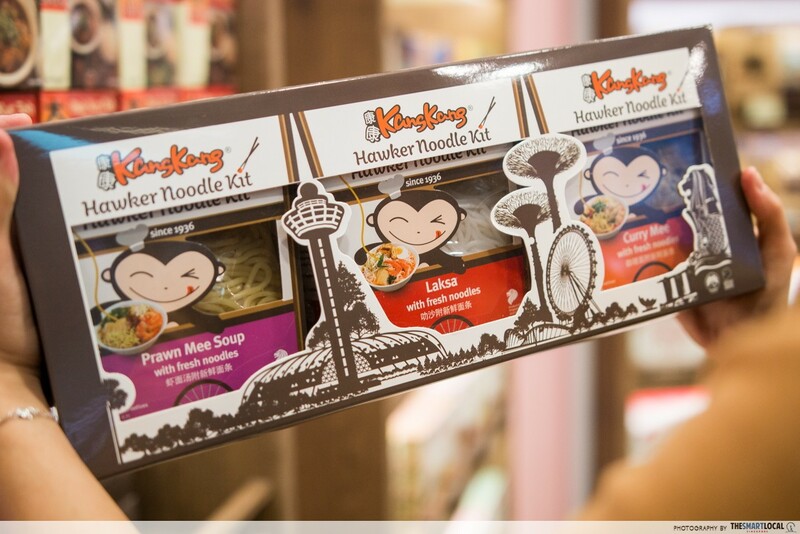 The pack consists of 3 individually packed noodle dishes that are synonymous with hawker food: prawn mee soup, curry mee and laksa. 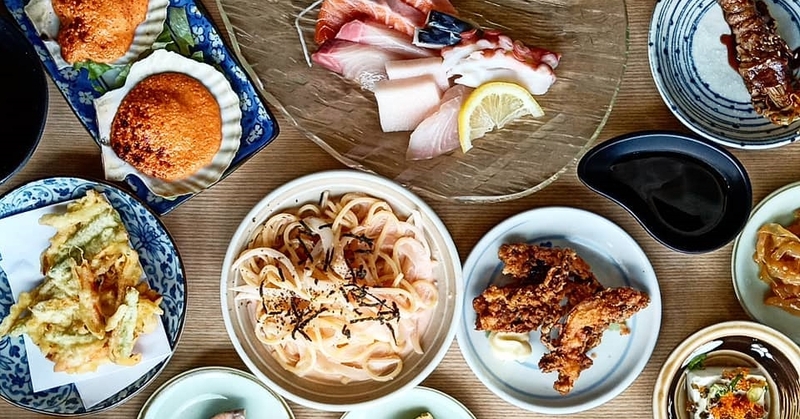 Each dish is pasteurised and has a shelf-life of about two months, so your friends can enjoy this authentic hawker dish under 5 minutes, whether they're in SG or not. Instant noodles are just about a staple in lots of Asian homes; it’s almost a crime to not have a stash of them somewhere in the kitchen for emergency late-night meals. 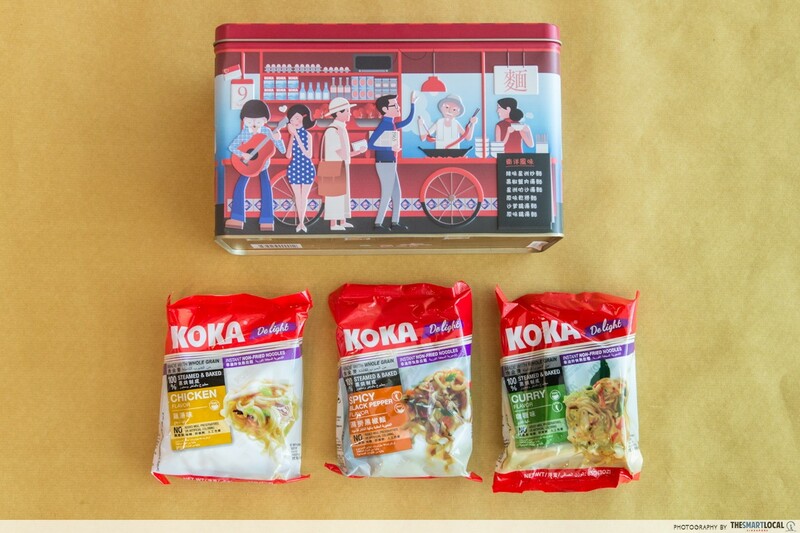 Tat Hui’s KOKA Gift Box ($31.30) has 7 noodle packs, and the noodles are made with superfine wholegrain flour and are 100% steam-baked to perfection. A pair of KOKA chopsticks will also be included in the box. 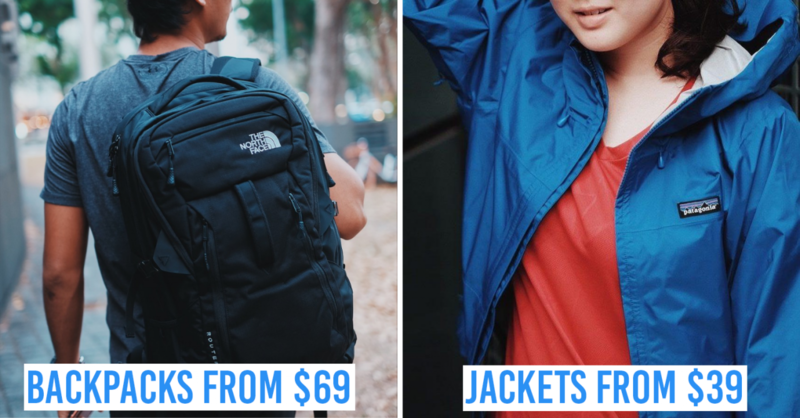 If you’ve arrived back in SG and know someone who practically inhales instant noodles, this’ll suit them 110%. 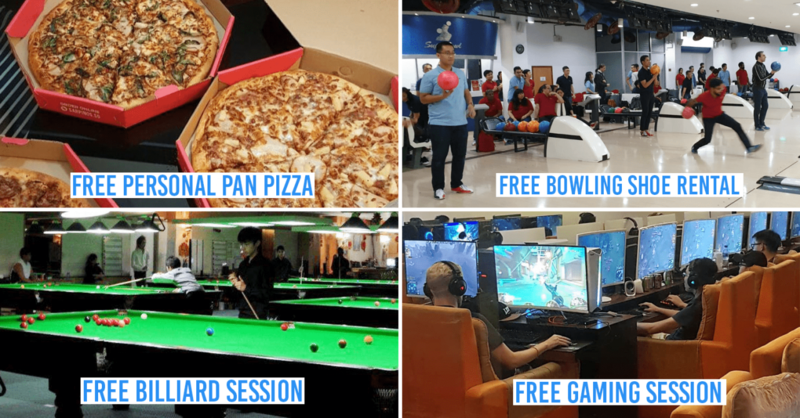 Or better yet, if you have foreign friends visiting, intro the world of the ultimate quick-fix meal to them, and let them bring home a few for their own friends and family! Good things are meant to be shared, and our diverse cuisine is one of them. 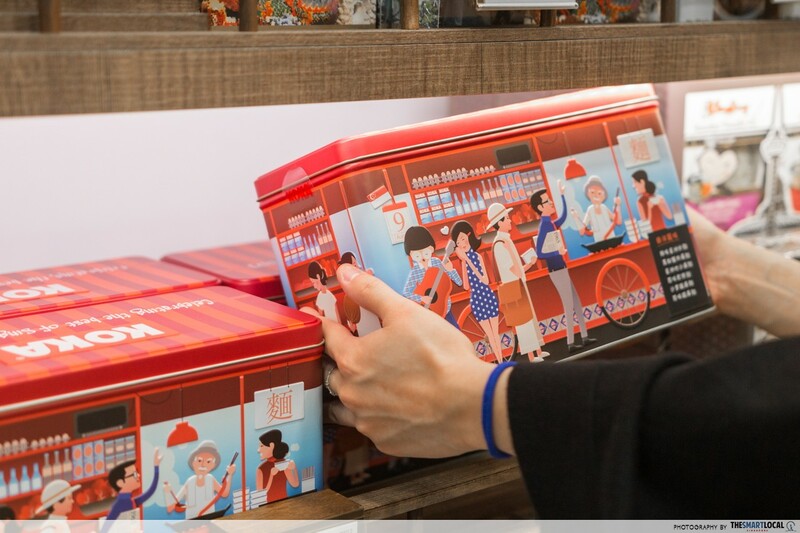 To share this goodness with your family and friends back home, the Singapore Food Manufacturers’ Association is collaborating with Focus Network Agencies to introduce 20 of our local foods in cool souvenir-worthy gift packs. 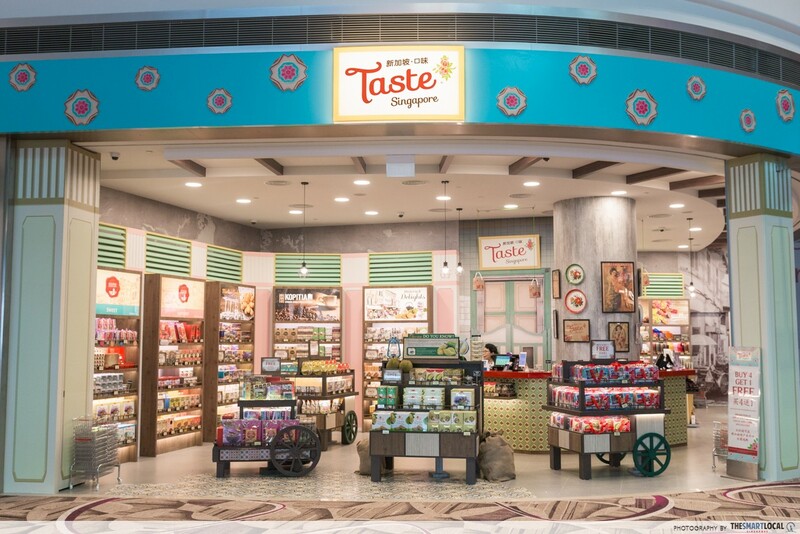 So if you’re about to fly off and are still scrounging for a good gift quintessential to Singapore, stop by the Taste Singapore outlets at Changi Airport's T1 or T4 transit area where these food gifts are housed, or check them out online here. Who knows, you might just find the perfect present to bring home nestled right here. 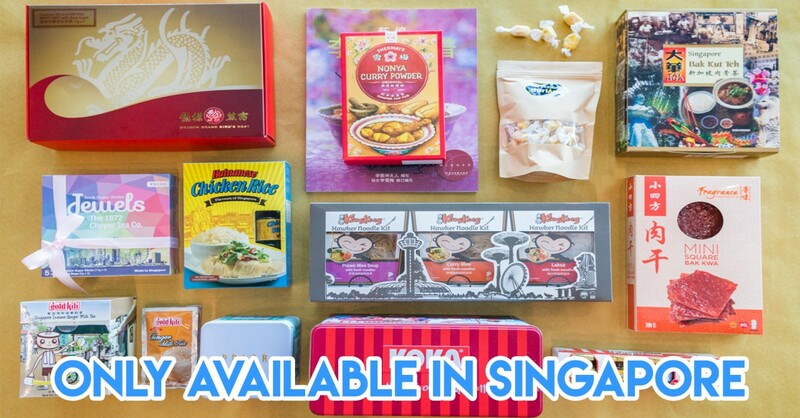 Find out more about #SGFoodGifts here! 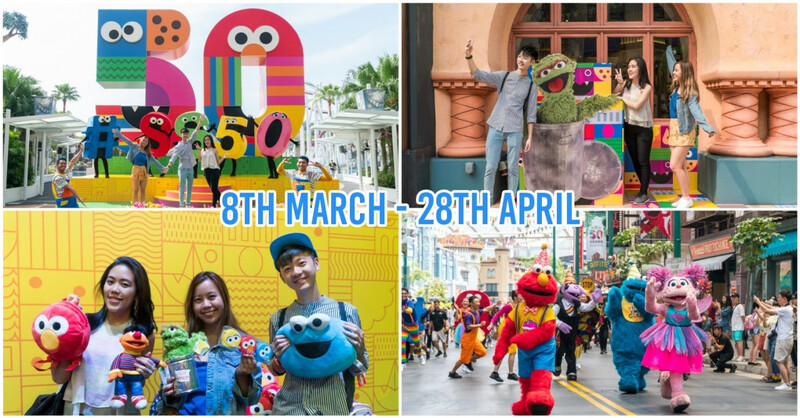 This post was brought to you by the Singapore Food Manufacturers’ Association.